Now, this needs maybe a little bit of an explanation. The reasons why a company undertakes such a program have to be made explicit. They must relate to essential challenges for the organization.They must also be sponsored at the highest level. It has to be a driver of creation rather than a problem-solving motivation. 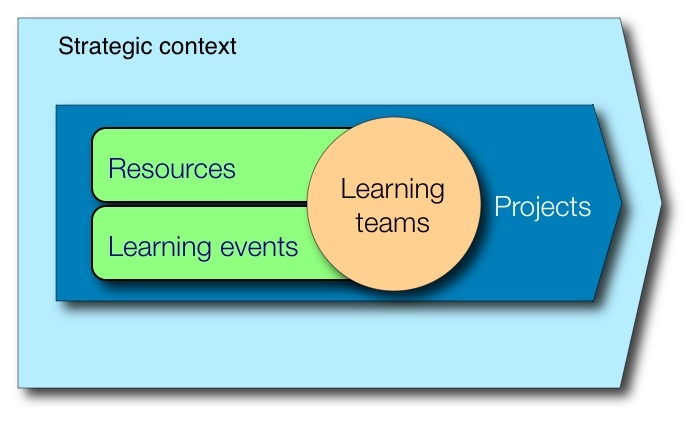 In a “learning by doing” approach, projects is where learning happens. These projects share usually some common characteristics : strategic, cross-functional or cross-BU, challenging goals, sponsoring at the top and regular steering, innovation (or at least exploration dimension),… They are led by teams. From time to time (every 6 months or quarterly), the team needs a longer time dedicated to learning. These learning events can be designed as an opportunity to share with other colleagues that are not in the learning teams, or they can help the team to deepen one particular point with experts or with other companies. Learning expeditions can also be very useful. What is key is that the learning team decides and designs itself the learning events. Resources have to be at disposal for learning. This has to be done upfront and without avariciousness. These resources range from books, online resources, DVDs, individual coaching, mentoring, 360°, etc. The more accessible are the ressources the more likely will the participants take advantage of them. I believe that giving directly the decision power to the teams on how to spend the learning resources budget is the best thing to do. Each ingredient can be blended with the others depending on the organization’s goals. This looks like blending grape varieties in wine making. I help you design your own program.